Current specials are designed to save you the trouble and expense of sending in your knife for custom fitting. Usually have some Bowie/Southern Comfort packages already made up for immediate delivery. Call or email to order. Check, Money Order, or PayPal. "... If your going to have an Ontario Hell's Belle, it's not really totally complete without one of Mike Sastre's Southern Comfort sheaths." - Bill Bagwell, Knifemaker (hand-forged edged weapons). Note: Ontario Bagwells are no longer in production. All the Hell's Belles, Fortresses, and Gamblers are gone, but I will continue to make Southern Comforts for your Ontario or Custom Bagwell. My personal Custom Bagwell Hell's Belle has a 10 5/8" blade, and I can carry it concealed while wearing shorts and a t-shirt, with no one being the wiser - even while seated in a restaurant. Bill Bagwell Contact Info: For those of you wondering, Bill Bagwell is still forging Custom Bowies, and doing so even better than ever. If you want the "real deal" Bill Bagwell Custom Hell's Belle, call: 903-938-0905. Serious calls only. 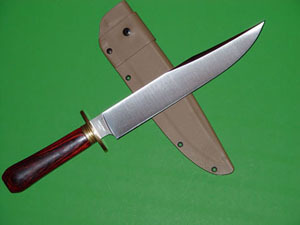 The Ontarios are considered "fighters only" (Excellent coupled with Comtech Bowie techniques), while the Cold Steel Laredo is, in my opinion, the best "all around use" production Bowie today. I highly recommend any Bowie in the Cold Steel line. Still have a very limited number of Laredos in Carbon V.
Other Cold Steel fixed blade packages available. The Southern Comfort sheath works very well with the Black Bear Classic, OSS, Tai Pan, and of course, the Trailmaster or Recon Scout. - Call or email for prices and availability. 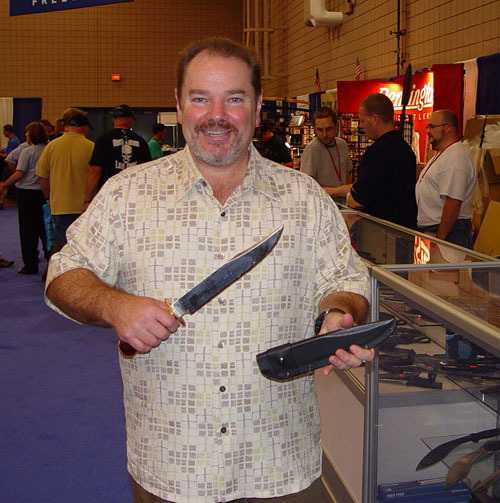 Lynn Thompson of Cold Steel Knives has been carrying his Bowies in Southern Comfort since the Trailmaster was their top of the line Bowie. Managed to make a very special buy on a LIMITED number of Cold Steel's top of the line Bowie, the Natchez, in San Mai III steel, and can pass the savings on to you. Big, Bold, Beautiful, and Balanced very well. Get one while supplies last! 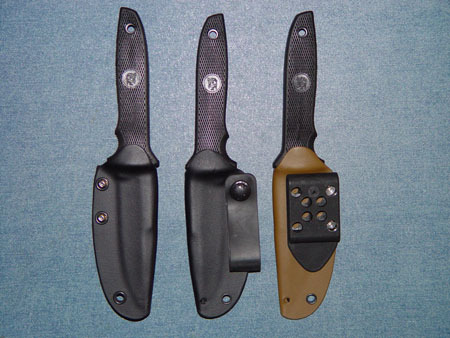 The Gryphon M-10 is long considered by many to be the Classic utility/self defense knife. 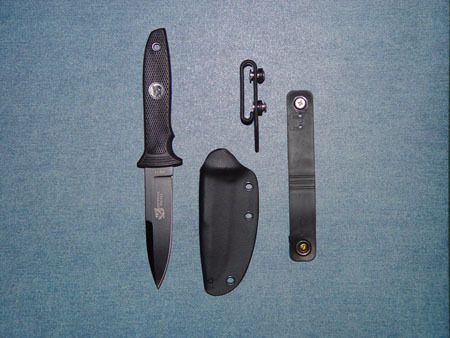 This Bob Terzuola designed 4" fixed blade was featured in James A. Keating's "Drawpoint" video/DVD, another true classic in its own right, but has been unavailable for the last 2-3 years. The Gryphon M-10 has now re-emerged with an upgraded VG-10 blade with black DLC finish and a custom fitted RCS Drawpoint sheath to compliment it. I've been making my Drawpoint sheaths for the Gryphon M-10 as an after-market option for close to 20 years, so when Cutlery Shoppe brought back the upgraded version, Jeff Loffer and I both agreed that I'd be the logical one to make the sheaths for it. It's no secret that I don't do production work - too many compromises have to be made - so by special arrangement, the knives are shipped to me so that each one can have a custom fitted River City Sheath with the famous "no movement, no rattle" lock-up that retains the knife securely, yet deploys with lightning speed. The Drawpoint sheath comes with both a Spyderco G-clip and an IWB loop that has a Pull-the-Dot Snap, to give you tremendous carry versatility. They are attached using screws and posts, so both are reversible and angle adjustable, allowing you to always get the side of carry and edge orientation you desire, or you can remove them, and attach the sheath to a harness system as another carry option. Because the G-clip has a small hook on its bottom edge, it can also be worn IWB without a belt, as with "sweats" or running shorts. I seriously doubt there is a finer, more versatile, "off the shelf" knife/sheath combination available, even at twice the price. Standard color is Black, but you can also choose Olive Drab, or Coyote Brown at the same price. Carbon Fiber pattern Concealex is available at additional cost.